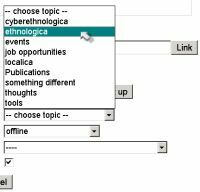 In order to be able to publish stories at Ethno::log and to be able to submit comments on stories, it is necessary that you register yourself. It's quite easy to register: At the right side of the startpage you find the sentence "You're not logged in ... login". The word "login" is blue and clickable (see the first illustration, inside the red ellipse). Click it. The login-page appears. There you can read the sentence: "If you're not registered, you can do this here." The word "here" again is blue and clickable (see second illustration). Click it. Now the registration-page appears (see third illustration). Think of a username for you first. You can use your "offline-world-real-name" or imagine a screen-name. Whatever you came up with -- put it in the topmost box. Now choose your personal Ethno::log-password (which later will grant you access to the abilities to write stories and comments). Just imagine some password, which you won't forget and type it the second box from the top. (The password will be displayed as a series of asterisks.) Type the password once more, now into the third box from the top (This is to ensure that you really know your password and that you haven't misspelled it the first time). Next you'll have to type your e-mail address into the next box. Underneath this box there's a small square (see illustration; inside the red circle, at the tip of the fat blue arrow). If you click the little square, a small hook appears inside it. That means, that the Administrators of Ethno::log will be able to see your e-mail address. If you don't put a hook inside, we won't see your e-mail address. In case you've put a hook into it, but want to have it dissappear again, just click once more on it. Now there's just one box left. If you got a homepage and you want this homepage easily to be reached by the readers of Ethno::log, put the URL of your homepage into this box. The effect will be that your username (which will appear at the top of every story you put on Ethno::log) will get clickable. If anyone clicks your name, he will be directed to your homepage. Instead you can put your e-mail address into this box. Again your name becomes clickable and a click on it will result into an e-mail window, already adressed to you -- so every Ethno::log reader can easily reach you by e-mail. If you want none of this, just leave this box empty. Now you're nearly done -- you only have to click onto the "register"-button (see illustration; at the tip of the green arrow). Now that you are registered, Ethno::log 'knows you' and will grant you access to the ability to write stories and comments. Ethno::log will 'recognize' you, if you tell it 'that you are you' -- you have to login. It starts just like above: At the right side of the startpage you find the sentence "You're not logged in ... login". The word "login" is blue and clickable. Click it. The login-page appears. Type your username into the first box from the top, and your password into the second one. Click the "login"-button. That's it. 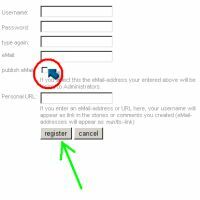 If you put a little hook into the small square besides which you can read "remember me", you won't need to type in username and password in the future -- Ethno::log will recognize you automatically each time you reach it and will login you automatically, too. Now that you are logged in, you can comment and publish on Ethno::log. 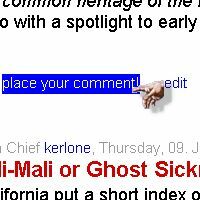 At the bottom of every story on the main page you'll find the sentence "place your comment" in blue and clickable (see illustration). Click it if you wish to add a comment to the story. Now the comment page appears. 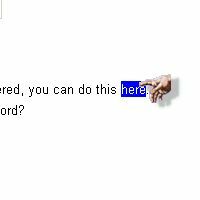 Write your comment into the text-box. Just click the "save" button and your comment is added. That's all. If you want to put an own story into Ethno::log, do like this: On the right side of the main page you find the sentence "... create a story" blue and clickable (see illustration). Click it. A new window appears. Write the title of your story into the topmost box. Write the text of your story into the big box. Now click the little button with the tiny upside-down black triangle at the right of the box wherein is written "-- choose topic --". The list of available categories into which you can sort your story will roll out (see illustration). Click on the category into which your story fits. Now click on the similar little button which is to be seen at the right of the box wherein is written "offline". 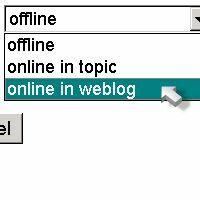 On the appearing list (see illustration) you can choose between "online in topic" and "online in weblog". Normally you will choose "online in weblog" -- that means that your story will appear at the top of the mainpage. If you choose "online in topic", your story will become visible only to those readers who click on the category into which you sorted your story. Now you only have to click on the "save" button and you're done. Return to the mainpage and then hit the Reload-button of your browser. Now you can see your story at the top of the mainpage of Ethno::log. If you want to point to a internet adress, the most easy thing is to insert the url as it is. Just copy it from your browser adress line. Dont forget the "http://" at the beginning. Then it will be converted to a clickable link. For example, I write www.yahoo.de, and as you can see, you can click on it. Now, just try what you learned! You can't damage anything. You can write an article for testing purposes and delete it afterwards (you can delete your own articles). thank you so much, zephyrin!